For years, the KATA design team has been designing camera bags which provide much more than great solutions – they are more like a response to a wish. Today, people who carry their camera around with them wherever they go don't want to look like cameramen. They seek comfortable, versatile and good-looking bags which can also carry a camera plus accessories, securely and with ease. KATA's DR series which debuted a few years ago offered all that and more. The Digital Rucksacks had a sleek profile and excellent weight distribution, with clear separation between the camera area and the place for personal gear. Some models also carried a laptop or tablet which has become an inseparable part of our life. 1. The DR comes in 3 different sizes, their design is more streamlined and they have more external pockets for extra functionality. 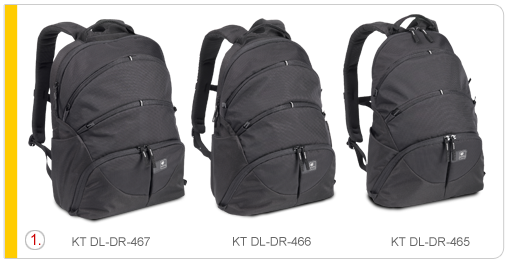 Digital Rucksack 467-DL fits DSLR + 17'' laptop. 2.The DRs come with a removable padded insert. When carrying a camera and accessories, the insert secures the expensive gear in place and enables easy access. Once removed, the DR becomes a comfortable everyday rucksack. 3. The cool padded back of the bag allows you to carry your equipment comfortably, while a chest belt provides balance. The rucksack is also compatible with the Kata Insertrolley (KT VG-DTS – sold separately) or can fit onto your rolling luggage. 4.The provided elements cover protects your valuable equipment during extreme weather conditions. Simply place over the bag for rain protection or use as a dust cover.